There are five size options from XS to XL. Just one frame color is available for now. If you’re turned off by current bike prices, this bit of news will bring a smile to your face. 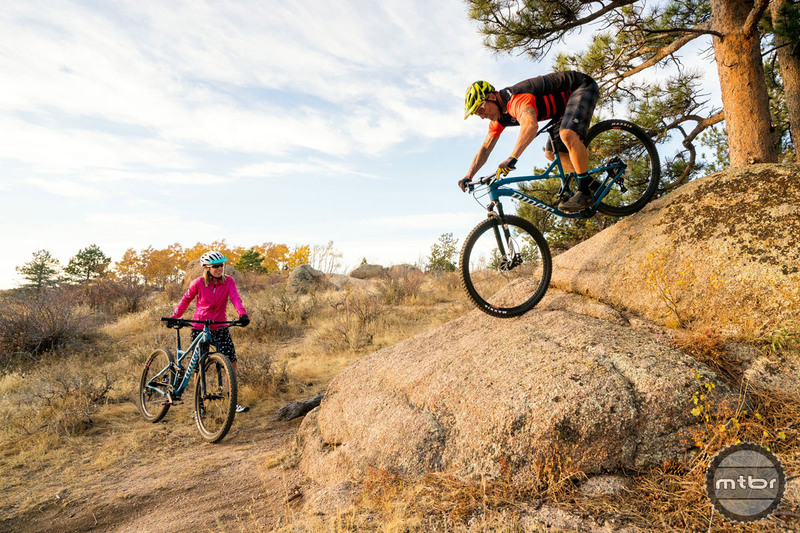 This week, Niner expanded its Jet 9 trail bike line-up to include a budget-friendly $2600 alloy option to go along with the current carbon frame offerings. You don’t have to break the bank to get a bike that can rip. The new 1x-only set-up features a SRAM NX1 crankset with 32t direct mount narrow wide chainring, 73mm bottom bracket threaded shell, and ISCG 05 tabs for chain retention devices. 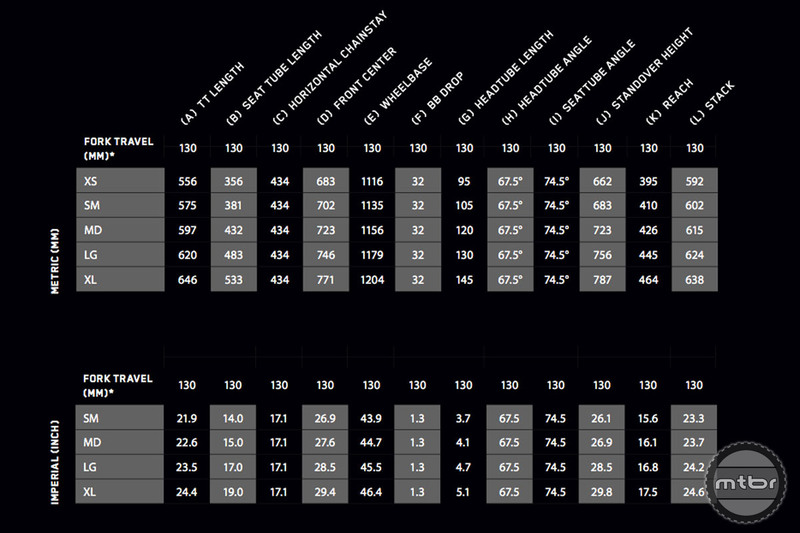 It also has boost spacing front and rear so you can run a standard 29er set-up or bump up to 27.5 plus tires. Wheels are Niner alloy, fork is a RockShox Yari 130mm, and the shock is RockShox Monarch. It does not come with a dropper post, but has both internal and external routing if you decided to upgrade. 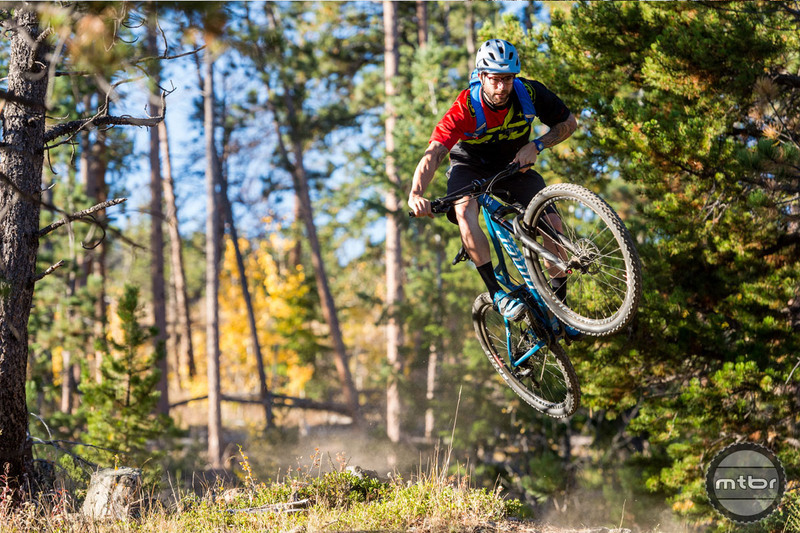 Read the Mtbr review of the Niner RKT 9 RDO XC race bike. because the lower swingarm linkage is located underneath the bottom bracket, so chain torque in any chainring effectively neutralizes the unwanted forces that degrade power transfer to the rear wheel. 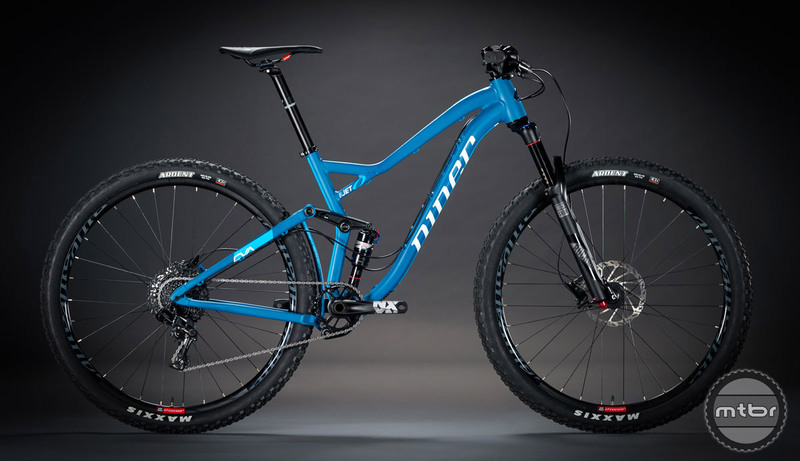 Niner claims that the boost spacing changes the bike’s suspension kinematics, paving the way for longer travel while achieving shorter, stiffer chainstays, which are 434mm across all five frame sizes, XS to XL. Overall dimensions lean toward longer reach on the frames so you can run shorter stems for quicker steering input. 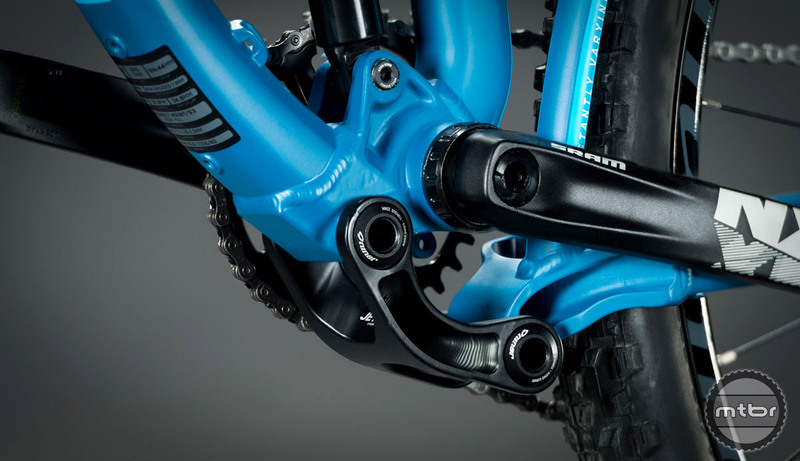 Likewise, the shorter chainstays allow for fast acceleration and playful pop. But to keep the overall feel of the bike well rounded and to ensure efficient climbing and pedaling, Niner steepened the seat tube angle to 74.5 degrees. This keeps the rider centered in the bike when climbing. Features include a BSA threaded 73mm bottom bracket with ISCG 05 mounts. 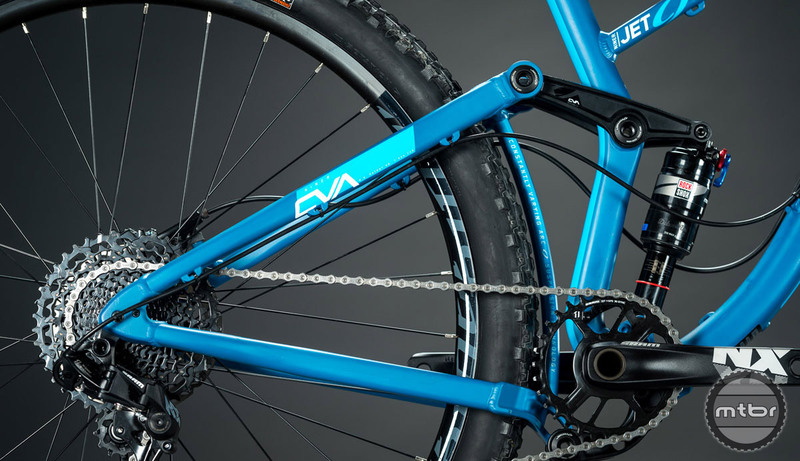 The Jet 9 alloy’s 120mm of rear suspension is built around Niner’s patented Constantly Varying Arc (CVA) suspension, which is optimized around 29er wheels. The 130mm of front suspension results in a 67.5-degree head angle. 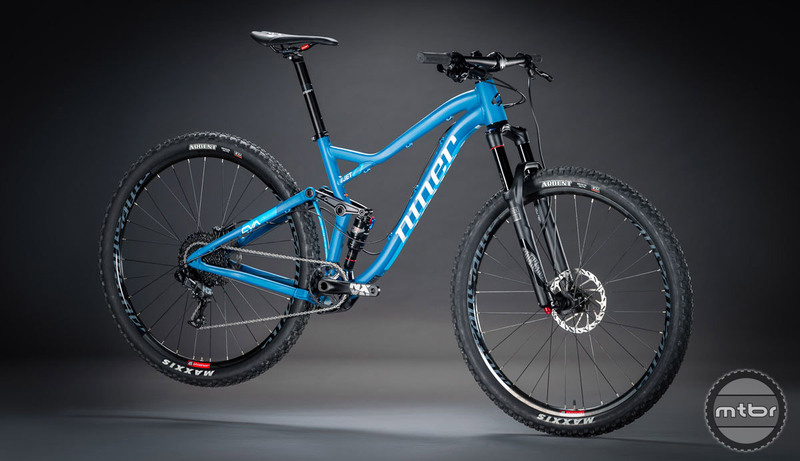 For more info please visit www.ninerbikes.com. Price of this new bike is a decidedly reasonable $2600. 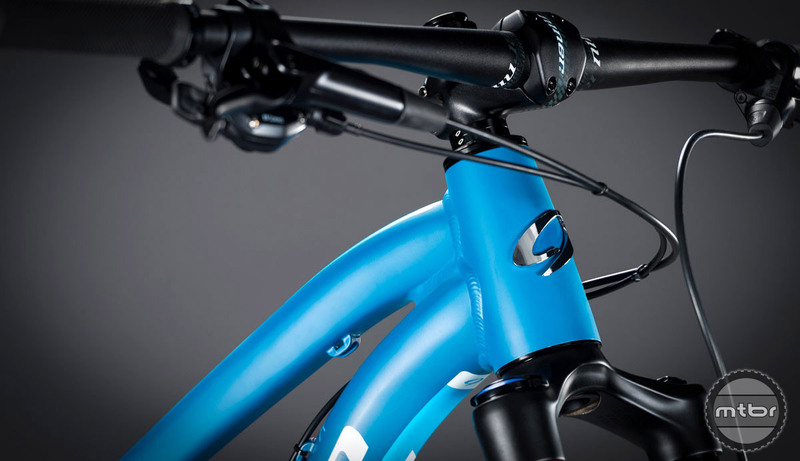 There’s accommodation for an internal or externally routed dropper, but the bike does not come with one. Dropping in on the new Niner Jet 9. 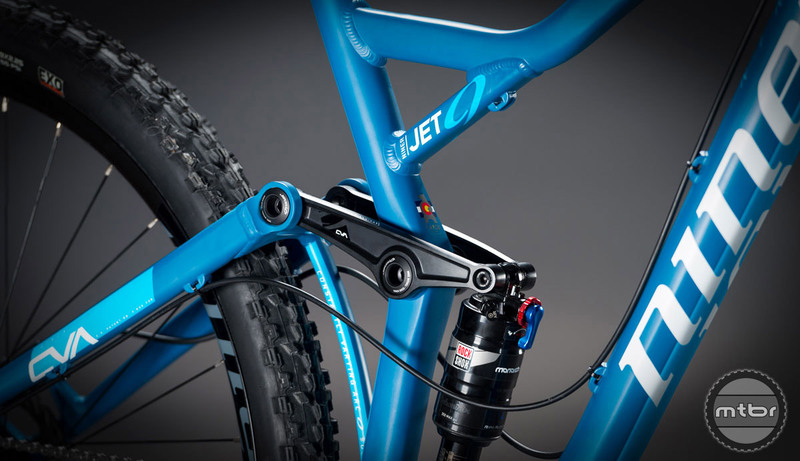 The Jet 9 alloy’s 120mm of rear suspension is built around Niner’s patented Constantly Varying Arc (CVA) suspension, which is optimized around 29er wheels. It’s designed to offer efficient pedaling because the lower swingarm linkage is located underneath the bottom bracket, so chain torque in any chainring effectively neutralizes the unwanted forces that degrade power transfer to the rear wheel. 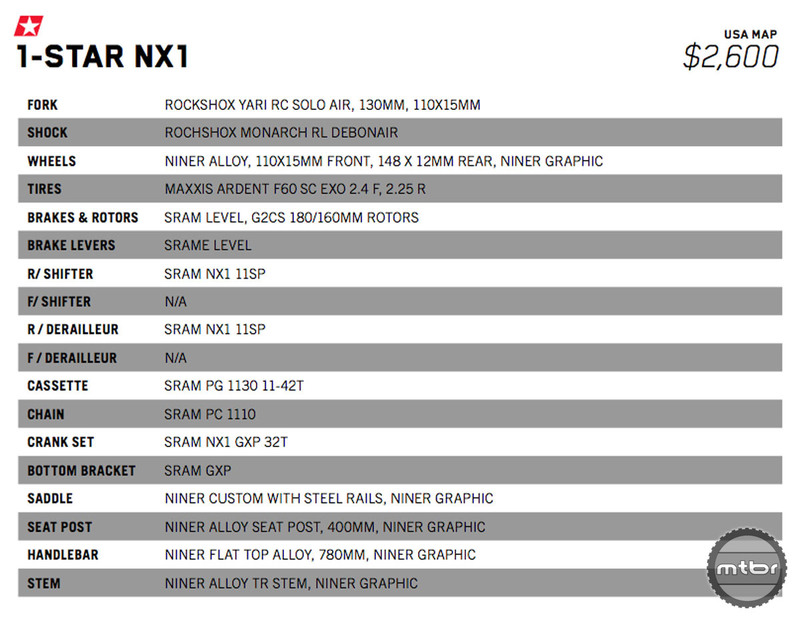 Here’s the full spec breakdown for the $2600 trail bike. Here’s full geo chart for this playful 29er (or 27+) trail bike.